First off, thank you all for helping me hit 55k+ views on this blog! That's probably nothing for a blog that's been going on for a little while now, but I appreciate everyone who stop by out of interest or other things. I know I haven't -truly- updated since LAST YEAR (ignoring my last couple of short posts). I've been really struggling to get certain things together in my life, so it's been hard to really update and make loads of posts like I used to, and it's extremely hard for me at the moment to really open up about the things I've been going through. I have so many drafts and things in my queue, so expect some new reviews, posts about my trips, and hopefully videos soon! 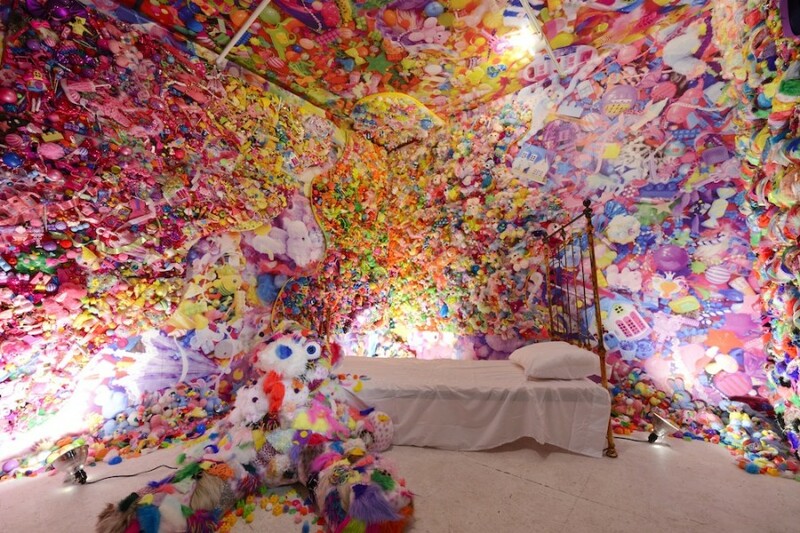 In the meantime I wanted to post about the gallery show Colorful Rebellion--Seventh Nightmare by artist & art director Sebastian Masuda, best known for being the founder of brand 6%Dokidoki, as well as having a major hand in various concepts and designs for Kyary Pamyu Pamyu and things like the stream show Kawaii International. He joined forces with gallerist Kianga Ellis to bring just a sample of his overwhelming kawaii style to New York City with this 'Colorful Rebellion'. I've been ITCHING to go and I meant to earlier this month, but due to ~life~ and other preparations getting in my way, I wasn't able to visit until the very last minute this past Friday afternoon. This exhibit was housed for about a month at Kianga Ellis Projects in Chelsea near the Highline. My best friend and I decided to stop on by while we were in the area, and I'm glad we did. It was an experience that I can't stop thinking about. "For his seven sins, which Masuda refers to as melancholic states of being, he chose desire, future, illusion, destiny, trauma, reality and self-identification. The various elements buzz wildly in the shiny toy stampede, composed so meticulously their organization resembles the shading on a Renaissance painting. While the visual stimuli alone is enough a reason to visit the installation, its true power lies in its status as a self portrait, both of the artist and of anyone who's experienced scars, want, judgement and escape." 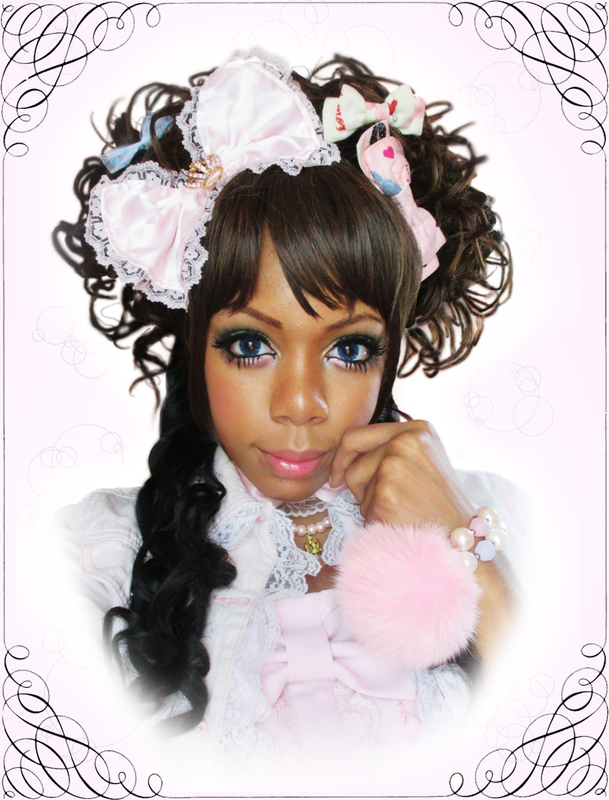 This video features 6%dokidoki shopgirl Yuka performing during Armory Arts Week. Indeed, when I entered this room I became very overwhelmed by the vivid colors and the somewhat-cloying content that plastered the walls. The bed in the corner was the only simple thing within that room... but of course it's use was for the visitor to actually lay on it and see the art from a different angle and perspective. Laying down on it and looking up at the the walls, I almost broke into crying because it began to bring up a lot of emotions about what I've been through the last few months. There was definitely a darker tone to it beyond the cute things, and it was trying to draw out a lot of impurities that I've kept to myself for such a long time. I took a photo with him before we went on our way. Sebastian is very much how I thought he would be in person-- he has this very 'cat'-like feel to his personality. It's hard to explain, but he's very chill and cool in person. 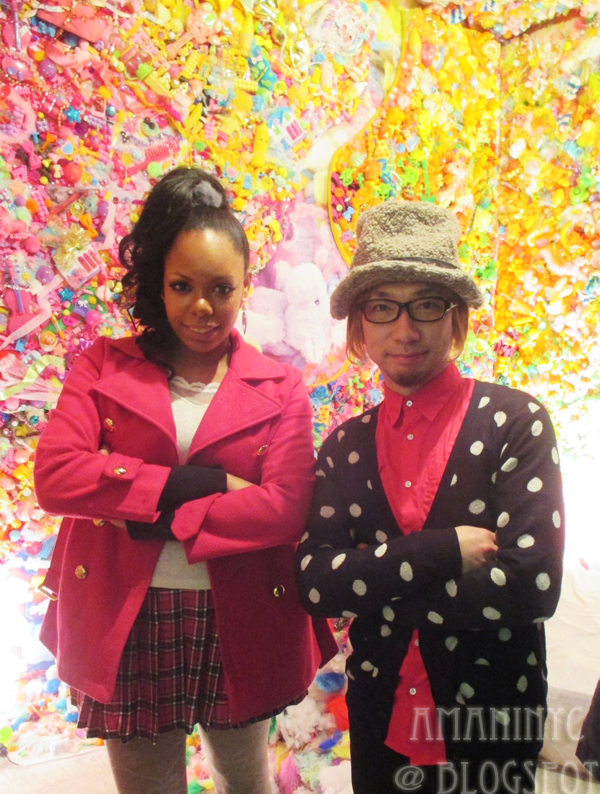 Muffy isn't into Japanese fashion but she liked him immediately because he was wearing his usual polkadots! I wish Seventh Nightmare was around for a little while longer! I hope that maybe it will end up travelling to other cities, so more people can get a chance to experience it.